There are 33 reviews of Dioressence. I have no idea what the original Dioressence, or any of its subsequent reformulations, smelled like. Nor do I care. Because what is wafting up from my wrist right now, from a bottle purchased from Saks just days ago, smells absolutely fantastic. I struggle to express just how happy these kinds of outsized, kitchen-sink green/chypre/orientals make me. Spraying them instantly tunes the world right up to eleven, eradicating with a great big "hell yes" yop every single scolding voice that pushes for attenuation and restraint. Screw that. I'm in the mood for clearing elevators. My review is for recent incarnation, poss from 2016. I want to like this as on paper its just up my alley but it is almost too overpowering for my tastes. Its a big patchouli bomb.If I spray very lightly I can just about get away with it and there are elements that I love but I think there is a bit of vanilla and too much of something else I can't place in the drydown,its compelling but a bit repellent at the same time.Will persevere as I blind bought a big bottle. I did put some in the rinse water when I hand washed a silk scarf the other week and its smells lovely on the fabric so maybe that's the way to go with this baby! This review is for the original, vintage formulation. Top Notes: Aldehydes, Orange, Fruity Notes, Patchouli, Green Notes, Bergamot. Heart Notes: Carnation, Tuberose, Cinnamon, Violet, Orris, Jasmine, Ylang-Ylang, Rose, Geranium. Base Notes: Musk, Patchouli, Benzoin, Vanilla, Oak Moss, Vetiver, Styrax. 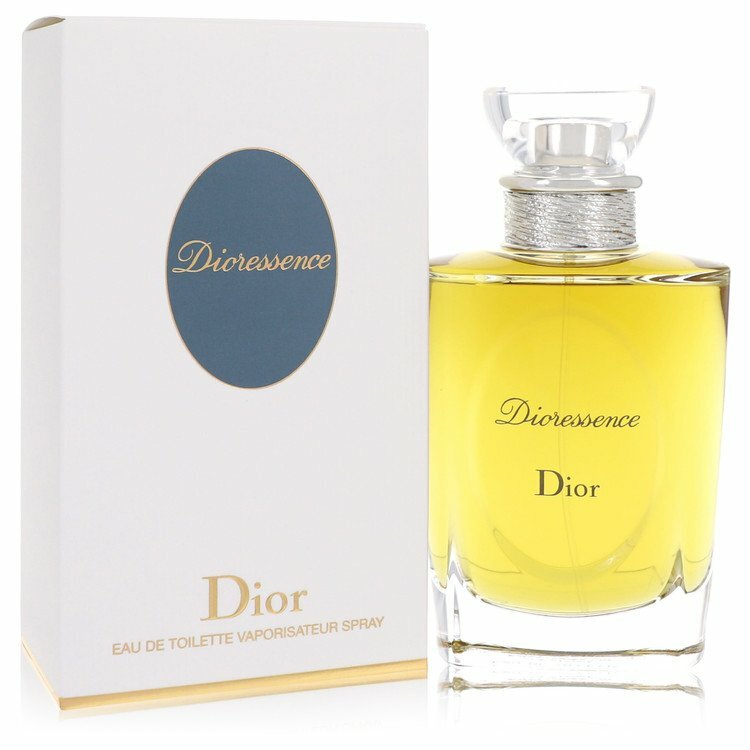 Dioressence was launched in 1979. The nose behind this fragrance is Guy Robert. To my nose, this is very much a classic chypre despite the fact that there is no labdanum listed in the notes pyramid. I detect a huge oak moss note that dominates the entire composition from top to bottom and from beginning to end. I do detect some florals, most notably rose, geranium, and a tiny hint of carnation, but the florals are dominated by the oak moss and green notes. I detect aldehydes, orange, and bergamot upon initial application, but they fade relatively quickly, albeit not as quickly as the top notes of many of today's fragrances. The one note that characterises Dioressence more than any other for me is the oak moss. 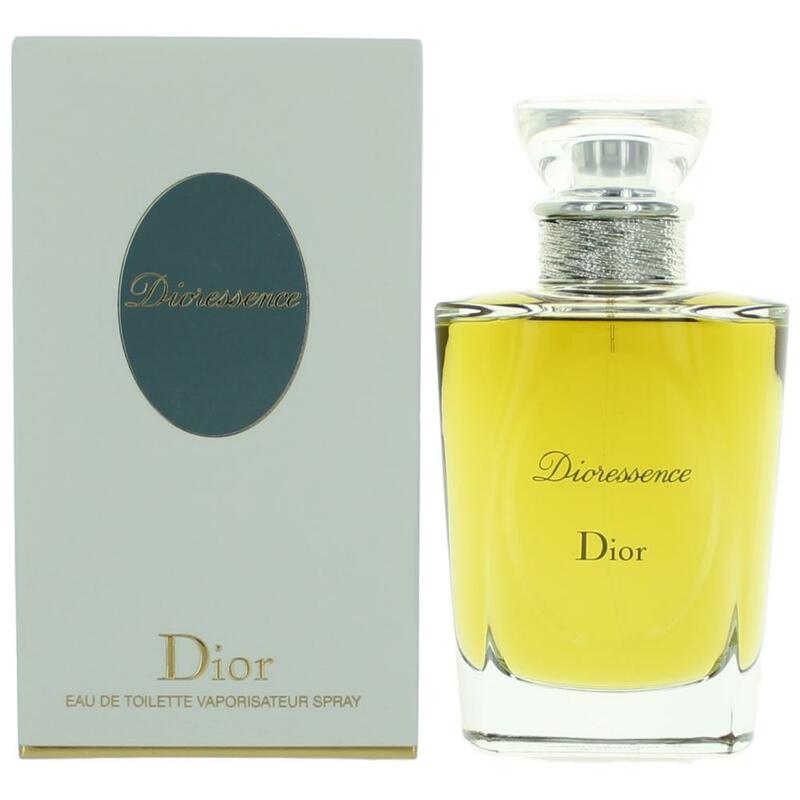 Dioressence smells trés chic, sophisticated, expensive and undeniably old school. It is very much a perfume of its era or even earlier than 1979. In fact, if I did not know better, I would have supposed it was launched in either the 1950s or 1960s. It is difficult to believe that this composition came at the end of the 1970s, just before the vogue for really big Orientals began in the early 1980s. As it is so unmistakably wedded to its time period, I cannot imagine young women of today wearing Dioressence, but it is nonetheless an exemplar of the very high end chypre fragrances of its time. This is a fragrance for chypre worshippers more than anyone else, and it is a fragrance for those who love and tolerate oak moss very well in large doses. I like oak moss, but this is an oak moss bomb. Anyone who wants to know what real oak moss smells like should sample vintage Dioressence. Longevity and sillage are good+. Projection is good. I applied it approximately eight hours ago and can still detect it on myself. This review is for the reformulated version currently at Sak's and Neiman. I have never had the opportunity to try the vintage. The harsh green opening is challenging for me and has a bit of an "old lady" feeling to it, which I think is the geranium and violet. After 5-10 minutes, it is an unapologetically bitter chore/oriental with a green tinge. At this point it reminds my husband of bitters from the bar. When the dry down hits, it is quiet, but gorgeous, with the cinnamon and patchouli so well-blended that they are not directly identifiable. It is gorgeous and lasts all day. 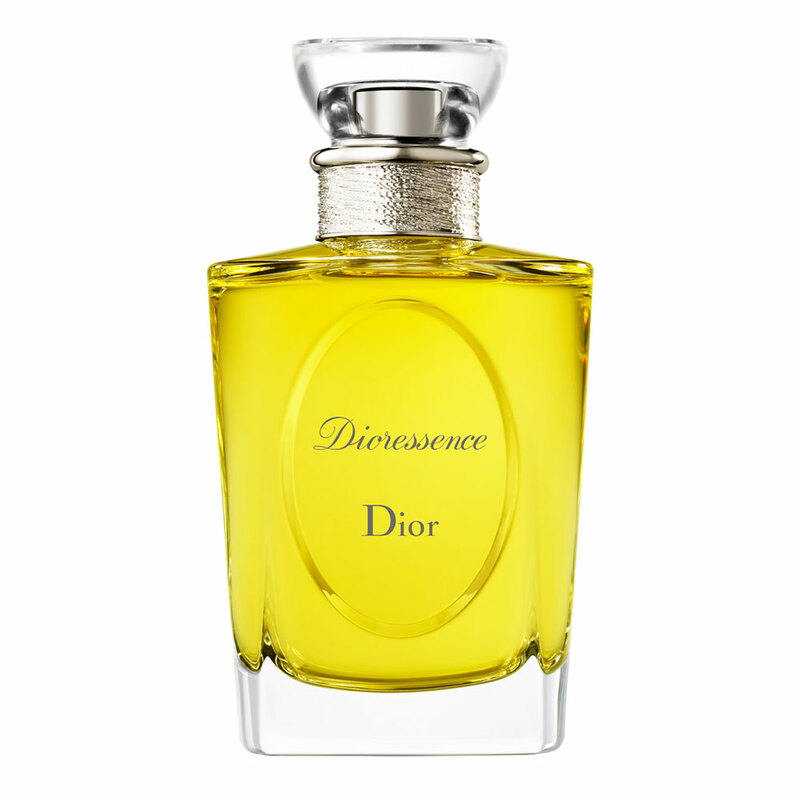 Dioressence used to be a lovely fragrance - especially in the Parfum strength. I would think it was definitely influenced by the trend started by Youth Dew and Opium, but it was greener and more delicate than other oriental fragrances of the same era. There were originally three strengths: Parfum, Espirit de Parfum and Eau de Toilette, and some lovely bath products too. I recently tried the new formulation, and was very disappointed: the overall scent is similar to how it used to be, but after wearing it for a short time, it changes and becomes a rather sickly, sweet, spicy nothingness. (I have found that Eau Fraiche seems to have undergone similar reformulation, though Diorissimo seems the same as it always did. I am currently putting-off trying Diorella and Diorling in case they have suffered similar reformulation). My thumbs up is for the original formula of this once-glorious perfume. I realise trends in perfume change, just like anything else, but I find it difficult to believe how so many houses (Dior, Givenchy, Guerlain, Patou, and even Caron, to name a few) are all but discontinuing some of their truly great perfumes, only to replace them with throwaway sweet nothings.